We are delighted to have installed the new Worcester Bosch Easy Control internet based heating control centre. We were asked to fit a new boiler in place of an old and unreliable Baxi 130HE combi. The customer opted for a new Worcester Bosch 30i system boiler and 300L unvented cylinder. The unvented cylinder has transformed hot water supply in the house from having one shower able to perform reasonably at 15 litres per minute, the customers now have a bath capable of delivering 20 litres per minute as well as two showers delivering 15 litres per minute. With 300 litres of hot water at 65oC and the 30KW boiler refilling the cylinder every 28 minutes, its almost impossible to run out of water. 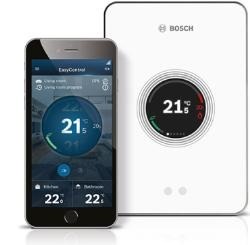 The Bosch Easy Control takes care of the control of the heating and hot water. From the customer’s iPhone a schedule can be set up to automatically start and stop the boiler when heat in needed. The controller takes account of the outdoor weather temperature and alters the output of the boiler to compensate for additional loss of heat through the building fabric as the external temperature drops at night.